In Part 1 of How Legal Apps Rank, available here, I examined the Apple App store category rankings of the WestlawNext and Lexis Advance apps. In this post, I will examine the legal apps we should all be paying attention to: the success stories. In searching for as many legal apps as I could find, I stumbled across many legal app pathfinders, bibliographies, and “best of” lists, but a special thanks goes out to the two lists that especially stood out: the often-updated libguide created by University of Wisconsin-Madison Law School Reference Librarian Jenny Zook and UCLA School of Law Reference Librarian Vicki Steiner’s guide. Also, I tried to be as inclusive and search for as many apps as possible–from apps produced by the big publishers, to those put together by the start-ups and the little guys. My methodology was to, again, plug the apps into App Annie, and examine the apps’ historical, categorical rankings. Again, I have limited myself to the Apple App store/apps designed for the iPhone or iPad. 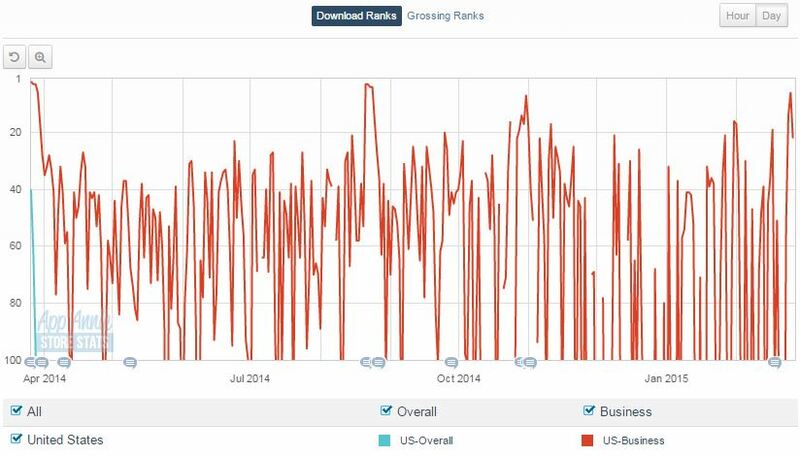 First, we can see this app has hit the #1 position in the “Business” category on a number of occasions (note that the y-axis on this chart has been reduced to 1-30, showing how frequently this app ranks highly). 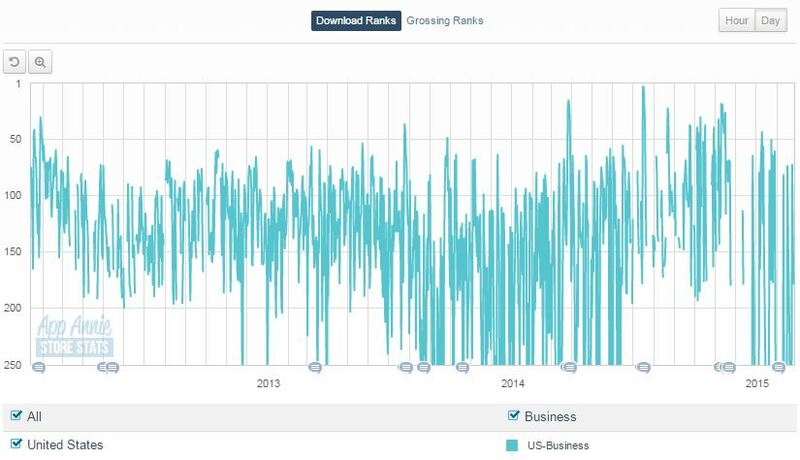 The “Business” category in the app store is generally the domain of scanning apps, .pdf readers, invoice/timesheet creation apps, and other esoterica–TrialPad genuinely sticks out for having such a specifically defined audience. 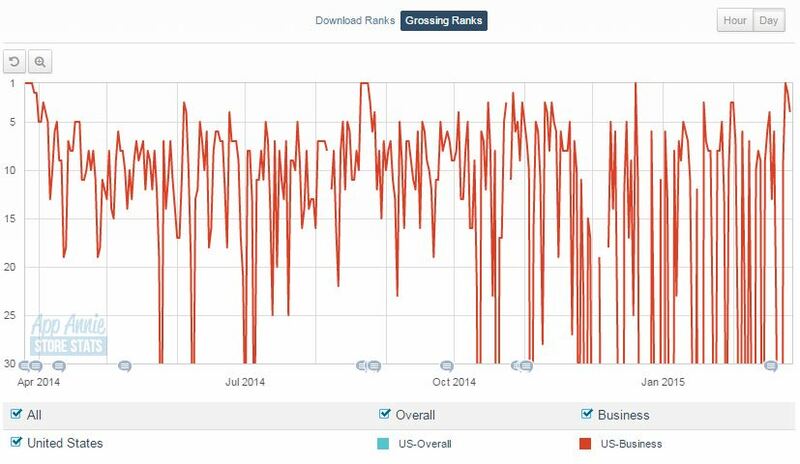 Also notable, this is the “Grossing Ranks” chart, as opposed to the “Download Ranks” chart. 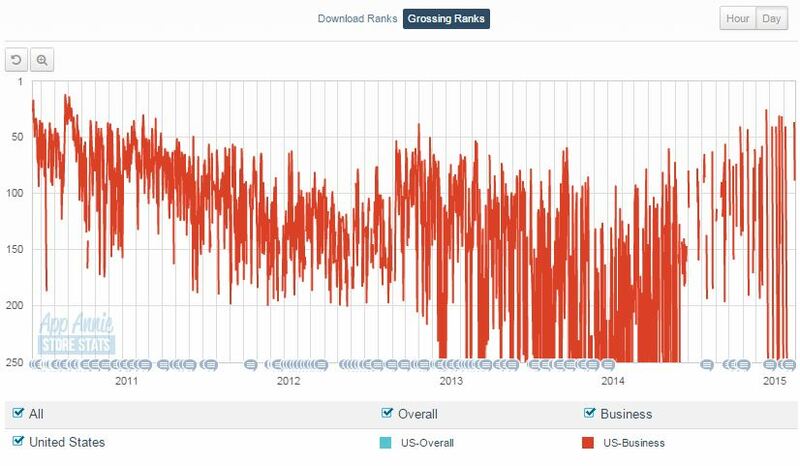 TrialPad, again, costs $89.99 which is higher than most apps and means less downloads are required to lead to higher grosses and therefore a higher ranking in the “Grossing Ranks” chart. On this chart, I have extended the y-axis values to 1-100; we can see TrialPad is not consistently in the top 30 like it is in the Grossing Ranks, but it still is a very high-performing app, and one that law librarians and information professionals need to have on the radar (as an aside, it appears this app has been on our radar as, beyond the times I saw it in app patherfinders and guides, I also recall this app being demo’ed at the 2014 AALL Annual Meeting Cool Tools Cafe by Debbie Ginsberg, Educational Technology Librarian from the IIT Chicago-Kent College of Law Library). All in all Lit Software must be commended for producing two of the most successful legal apps on the market, even more impressive that this coming from a start-up and not one of the big legal publishers. This app is ranked in the “Business” category (same as TrialPad and TranscriptPad), and is available for the iPad only. 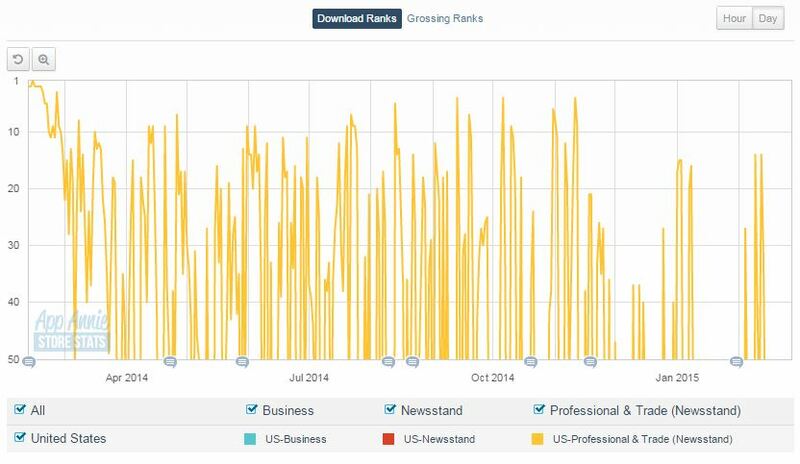 The y-axis is reduced to 1-250 in the above, which shows a consistent placement around the #100 rank. 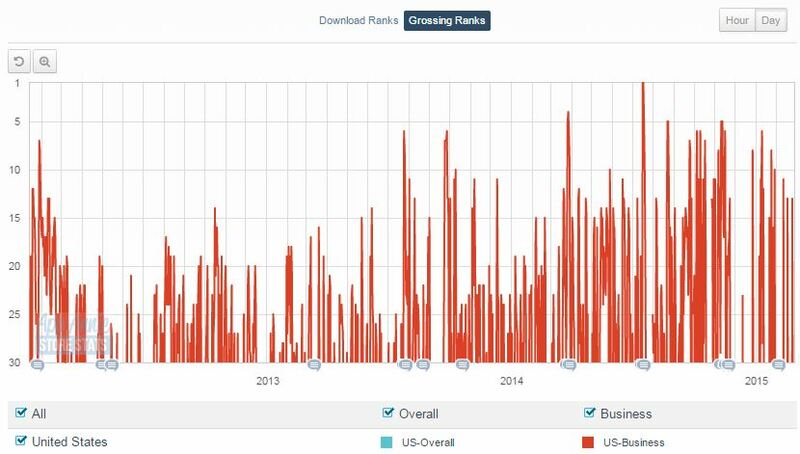 This particular app does cost $24.99, which is more than what usually dots the “Business” category in the app store, and means less downloads equal a higher bump in the “Grossing Ranks” chart. This is an older app, introduced in 2010, and still able to remain relevant, as per the above chart. 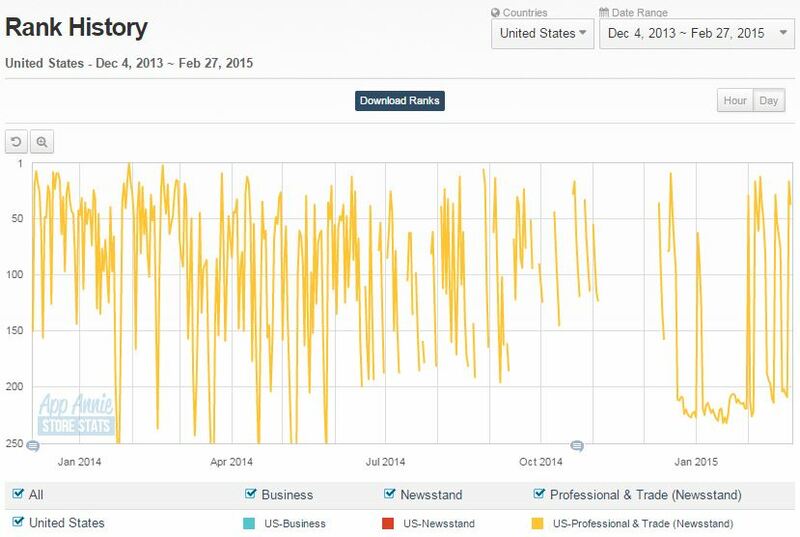 ABA Journal Magazine has broached the top ten in “Professional & Trade” a few times, even hitting #1 early in its deployment, on Feb. 13th, 2014. Both Practical Law The Journal – Litigation and ABA Journal Magazine exemplify that iPads (in particular) do an excellent job of displaying the content of serials. Not only are they visually appealing in app form, more than just the current issue is accessible, and navigation is not restricted to leafing through pages. The lesson: current awareness materials translate to tablets really well. In summation, those are the legal app success stories–thanks for reading!